On May 16, 2017 President Denis SASSOU N’GUESSO visited the site where the special economic zones will be built. It is a big project which will boost the Congolese economy and create around 100,000 direct and indirect jobs. 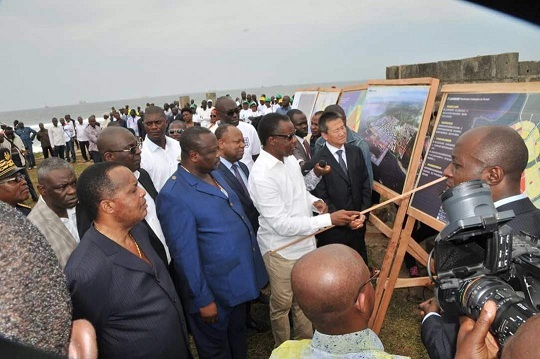 The Head of state of Congo visited the site, which has an area of 36 km2 bordering the Atlantic ocean, in the presence of honourable Alain Akouala Atipault, Minister of Special economic zones, honoura-ble Jean Jacques Bouya, Minister of Land use planning and heavy construction and the Ambassador of China in Congo, His Excellency Xia Huang. The President followed the way the delineation work and was determined to visit the site. We consider this as the President’s political will and as a green light so that the process keeps going on», Minister AKOUALA ATIPAULT said. According to him, the project will generate 1,116 billion US dollars by 2022, 2,180 billion US dollars by 2026 and 3,574 billion dollars by 2031. The Congolese Government and the Chinese Development Bank signed a memorandum of understan-ding in July 2016 on the undertaking of a feasibility study, the mode of investment and the financing of the special economic zone of Pointe Noire. «When the project started, the Chinese Ambassador said the Chinese Government expressed its inten-tion to work with the Congolese Government. The works are underway and the Chinese services staff and its Congolese partners are working hard to make things go ahead. The special economic zone of Pointe Noire will have a set of infrastructure, among which a mineral port, chemical and refined oil products plants, metal, food and drinks industries, fertilizers industries, timber and other products industries. The project is part of the Government’s policy to diversify the economy, which basically depends on oil revenues. There is a plan to create four special economic zones, specially in Pointe Noire, Brazzaville, Oyo-Ollombo and Ouesso. Development and earthmoving works relating to the site of Pointe Noire will start by the end of this year.